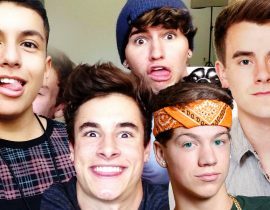 Lele Pons has been accused of being “manipulative” and “conniving” after her ex-friends Christian Delgrosso and Amanda Cerny posted some blistering commentary about her. 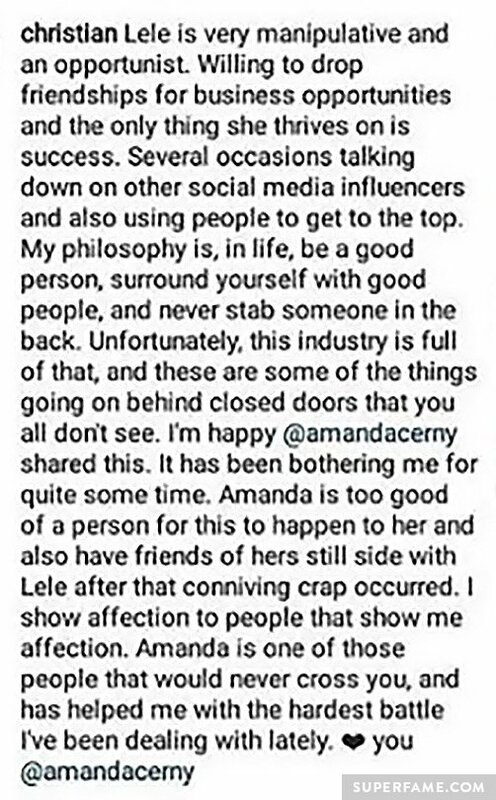 2017 Update: Amanda has revealed the status of her relationship with Lele (nowadays). Scroll to the bottom of the article for the update. Amanda claimed that Lele was secretly accessing her account and deleting her popular images, videos and posts from social media for six entire months – all the while pretending to be her best friend! Christian backed Amanda’s claims, and even threw in some shocking jabs of his own. Amanda Cerny posted the following image on her Instagram. 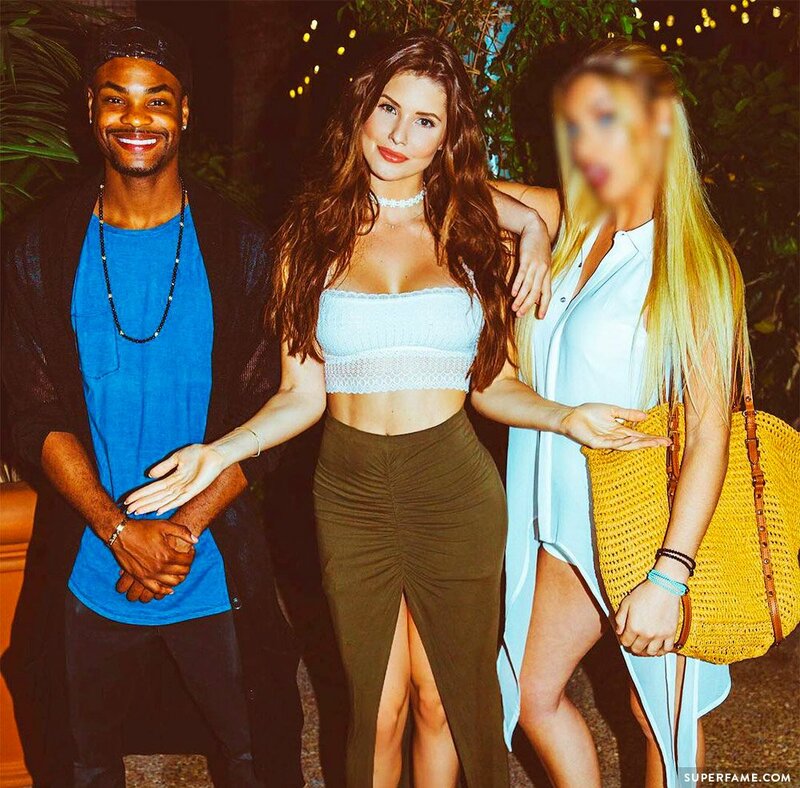 She blurred out Lele Pons’ face and proclaimed that she now knew who her REAL friends were. 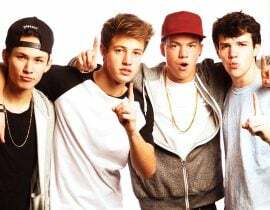 Amanda also provided a link to a piece she wrote on TheDirty about why she’s no longer friends with Lele Pons – her frequent collaborator. Amanda Cerny wrote a piece for TheDirty. 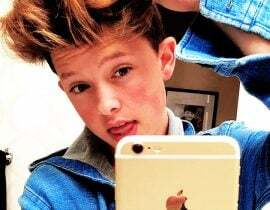 Amanda explained that around six months ago, her popular posts, images and videos on platforms like Instagram and YouTube started to disappear. Her accounts were also sometimes mysteriously put on private so that she could not gain new followers. These mysterious deletions were happening as recently as August! Whenever these deletions happened, Amanda revealed that Lele would always be there to comfort her. At first, Amanda thought that these strange occurrences were due to bugs or errors on the respective social media platforms. However, Amanda recently discovered a far more nefarious reason for her disappearing posts. Amanda was at a barbecue party with Lele, and was playing charades. She glanced over her shoulder at one point, and was shocked when she realized that Lele was on HER phone and using Snapchat. When Amanda grabbed her phone back from Lele, she saw that her previous photo was deleted. It was at that point that Amanda finally put the pieces together. However, she did not confront Lele at the party. 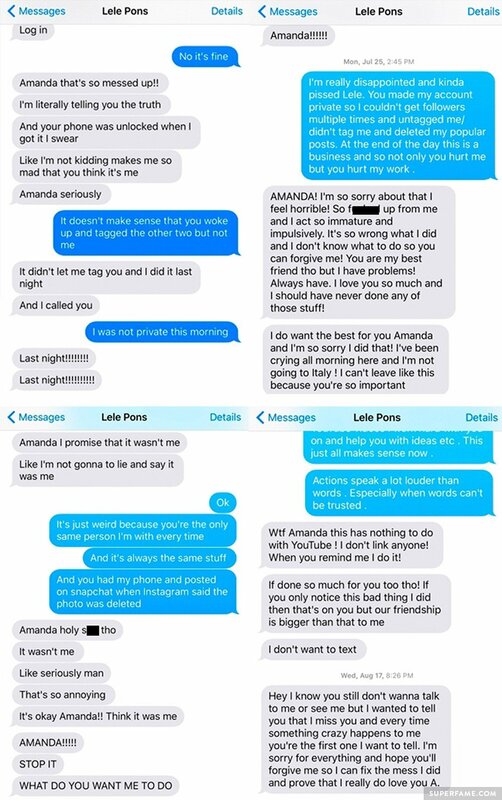 Amanda even attached some screenshots of text messages from Lele Pons. In the messages, Lele appears distraught after getting caught. On August 17, Lele can be seen begging for Amanda’s forgiveness after she ended the friendship. 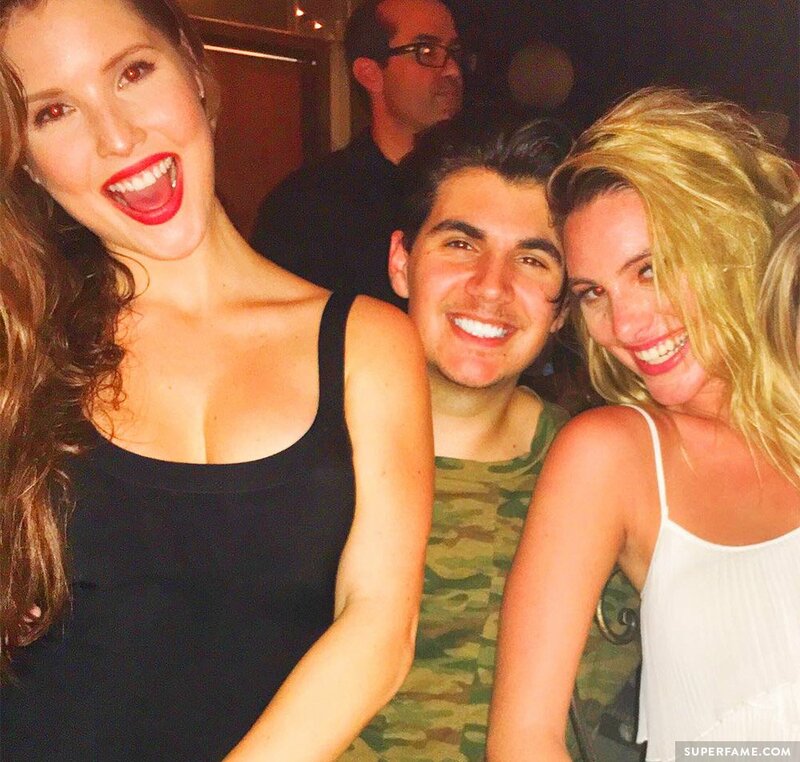 Christian Delgrosso was on Instagram and took Amanda’s side against Lele. 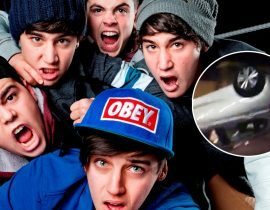 The trio used to be close friends, so fans were shocked when this occurred. 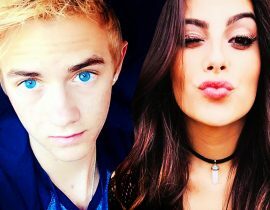 He blasted Lele as a “manipulative opportunist” who’s willing to ditch friendships for business. “She only thrives on success!” Christian wrote in a comment. 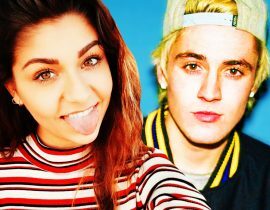 He accused her of secretly b******* about other internet stars and “using” other people to climb up the internet social ladder. “NEVER stab someone in the back,” he said. It’s 2017 now, and Amanda’s frosty relationship with her former friend Lele still appears to be languishing on the rocks. Amanda spoke once again to The Dirty in an exclusive chat. Amanda was asked by them if she had any contact with Lele since the incident, and if they made up. Predictably, Amanda responded that they actually have not talked at all. “We have not spoken,” Amanda said. She said that she wasn’t even thinking about Lele, and was instead focusing on her own “career and success”.